It was. Magic, I mean. It was a bit of a pain getting into work, I suppose, but lots of people gave up so it was quite empty. And we were sent home at lunchtime. So I walked through Victoria Embankment Gardens in a snowstorm and peeped over the pedestrian bridge to look downriver to Westminster. 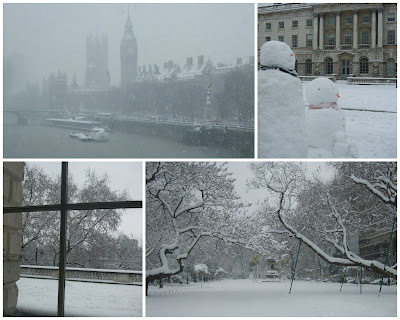 Then back through the gardens eastwards (snowpeople galore) to Somerset House (tourist snowfamily) and Temple. 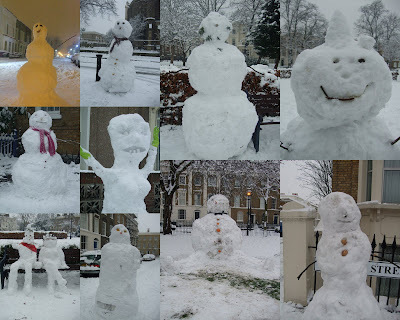 Back home, snowpeople on every corner, in front gardens, in parks. People talking to each other, reclaiming the roads, sharing snow photos and sending each other on quests for more exciting snowy works of art. Snow mice, snow bears, snow dogs, snow women, snow men. And an igloo. I always loved London in those first few hours after a heavy snowfall and, even though I'm now 200 miles away, I can remember how the sudden emptying of the city always meant that we Londoners could reclaim it for our own. So, thank you once again, for marvellous photos which conjure up so many memories. I thought about you when I saw in the news that it had snowed in London. It is always so magical when a big city gets a lot of snow I think. When I lived in France/Paris 2002, it snowed in Paris,and it was so beautiful. The natives kept saying that in never if rarely snows in Paris, then the following winter it snowed again! Wasn't it fabulous how the atmosphere changed so much? People seemed really happy, relaxed and excited, it was great!